Ringside Font Features: Stylistic Sets | Hoefler & Co.
Ringside takes advantage of Stylistic Sets, an OpenType feature that makes it easy to transform text with a single click. Many fonts contain stylistic or functional variations of individual glyphs, commonly known as “alternates.” When using such fonts, designers have traditionally had to hunt for these characters in a vast palette of glyphs, from which individual characters could be inserted, one at a time, into the text. OpenType fonts, when used in a type-savvy application, offer a much more convenient approach: related alternates can be grouped together as “Stylistic Sets,” which when activated will render all the changes at once, throughout the selected text. Below are some of the Stylistic Sets we’ve created for Ringside, accessible in the Adobe Creative Suite, the Cloud.typography webfont dashboard, and other supporting applications. Ringside contains a handful of alternate forms that can subtly transform the timbre of text. In contrast to its modern, straight-legged R, an antique form is offered with a curved leg (a shape type designers call an ogee), which can be invoked with Stylistic Set 1. Activating this set also changes all the glyphs that contain an R-like shape, including both sizes of the registered trademark (®), the Indian Rupee sign (₹), the Indonesian Rupiah (Rp), and the Rupee symbol (Rs) used in Mauritius, Nepal, Pakistan, and Sri Lanka. Three different forms of the capital Q have been designed for different circumstances. The “hockey-stick” construction is Ringside’s default, the appropriate choice in most situations. Stylistic Set 2 substitutes the “stovepipe” design, whose tail descends below the baseline, a useful form when the space between adjacent letters takes precedence over the space between lines. 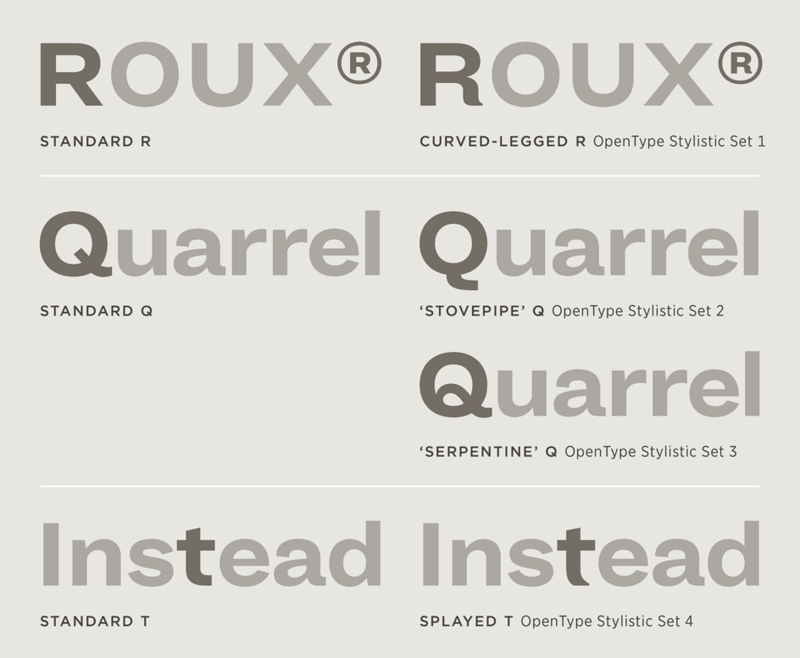 Stylistic Set 3 introduces a “serpentine” form, whose tail loops through the glyph and exits at the right, an especially colorful detail in Ringside’s broader widths. All three forms are available throughout the entire Ringside family. The lowercase t in Ringside has been designed for maximum clarity in text sizes, but the signature “fish-tail” design is retained from the Knockout family, and included in every style of Ringside in Stylistic Set 4. Ringside includes three different designs for the figure 1, each drawn with a specific use in mind. The default form has a flag serif at the head, to help distinguish it from the lowercase L and capital I in text. In number-rich environments where distinguishability is especially important, a figure 1 with both a flag serif and a baseline serif is included, a form that can be introduced with Stylistic Set 5. For headlines that contain a number beginning with “1” (e.g. Top 100, Since 1989), Ringside includes a simplified design that can be substituted with Stylistic Set 6. In Ringside’s heavier weights, these alternate forms can help eliminate the asymmetric spaces that usually surround the number 1, a useful detail when working with headlines. For designers using Ringside and Knockout together, activating Stylistic Set 8 will reintroduce three of Knockout’s most distinguishing mannerisms at once: the curved-legged R (and R-like characters), the splayed lowercase t, and the antique form of the figure 1. In the Ringside ScreenSmart webfonts, activating this feature within Cloud.typography allows the faces to serve as the perfect text-size complement to headline-sized Knockout. In its standard position, the colon sits on the baseline, to align visually with the position and scale of the lowercase. 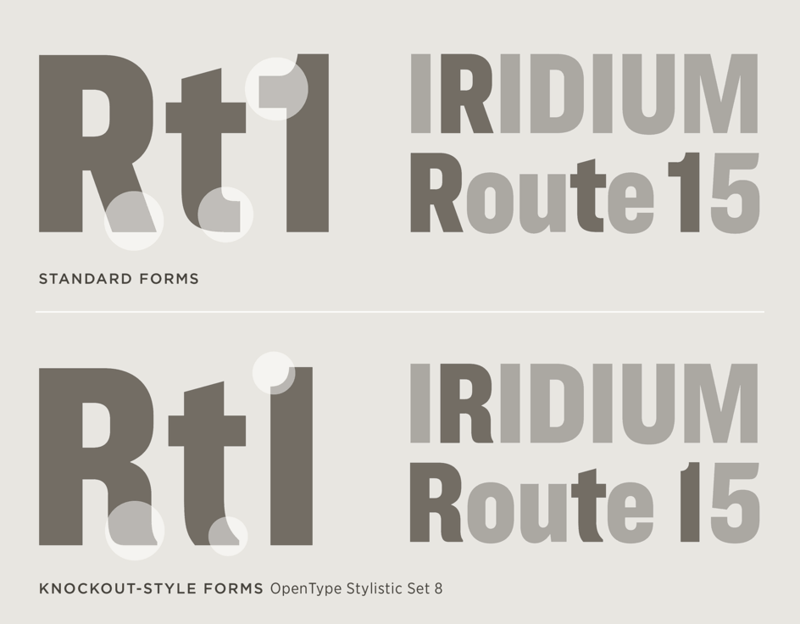 Each style of Ringside includes as Stylistic Set 7 an alternate design for the colon, which is raised to center on the capitals and the figures, an appropriate choice when setting timetables. The standard symbol for a registered trademark is superscripted, to align with the symbols for trademark and servicemark. Ringside includes an alternate form that matches the height of the copyright and publishing symbols, available through Stylistic Set 9.